Seville, Spain, is said to be the hottest city (temperature-wise) in Europe. Its inland location means it doesn't get the sea breeze that coastal cities get, and it can be pretty uncomfortable, especially at the height of summer. Luckily, Seville isn't too far from the coast, and it is easy to take a day trip to Playa Matalascñas, the closest beach to the city. The Playa Matalascañas is part of the Matalascañas coastline and is located in the Huelva Province. This urban beach is roughly 4 miles long, surrounded by the Doñana National Park, and situated on the Atlantic Ocean. You can expect fine sand at this beach, perfect for lounging and sunning. Playa Matalascañas is also great for strolling, as it has a pedestrian promenade that spans the entire beach. Most famous for its proximity to Seville, Playa Matalascañas also contains a well known ancient upside down tower called the Torre la Higuera. The tower was built by the king in the 16th century and is one of seven defense structures designed to protect Spain from foreign enemies. Another famous tower from the 16th-century is The Fig Tree Tower (Torre Almenara), also known as "the stopper". Only its ruins are visible due to the 1755 Lisbon Earthquake that destroyed the tower and the surrounding area, but since it is a part of the Spanish Historical Heritage, it is definitely worth checking out. Getting to Matalascañas is as simple as boarding a bus in the center of the city. It's important to arrive at the correct station in the Plaza de Armas, which should not be confused with the Prado de San Sebastian station. The journey takes approximately one and a half hours and there are several buses throughout the day, so this method of getting to and from the city is not only inexpensive but easy. It's also possible to rent a car and drive to the beach, but this will only cut your travel time down by a few minutes. It will, however, offer more flexibility, and if you want to visit more than one seaside destination, that is probably your best option. Playa Matalascañas is not a luxury resort with lots of facilities. Here you'll find plenty of sea, sun, and sand, as well as some beachside restaurants, a couple of shops, and a few hotels such as the Hotel Playa de la Luz. However, if you're looking for a bite to eat or a cocktail, you may be disappointed if you visit anytime other than the summer season. Despite the closings of major businesses, this beach is still best enjoyed during early to late spring or fall, and preferably during the week. This is because the beach can get very crowded in the summertime and, as a result, travelers may find it impossible to relax with so many people nearby, but, if you're craving the beach and don't want to go far, Playa Matalascañas is still your best option. Since Playa Matalascañas is perfect for sunning and swimming, but not much else, if you'd like to combine your beach visit with some more cultural activities, or if you prefer towns to beach resorts, check out the other beaches in the area. You can walk for several miles in Playa Matalascañas, you will eventually end up at the beaches of Doñana National Park that border the Gulf of Cadiz. Another beach that is reasonably close to Seville, (about 90 minutes away) is El Puerto de Santa Maria. It is located about an hour and 15 minutes from the center of the city, and just ten minutes by train from the city of Jerez. Bear in mind that the beach is a 40-minute walk from the train station, so you may want to take a taxi or jump on the local train to the Valdelagrana stop. The train will be longer, but you will inevitably save time and energy by choosing this option. El Puerto de Santa Maria is highly rated for its beauty as well as its amenities. 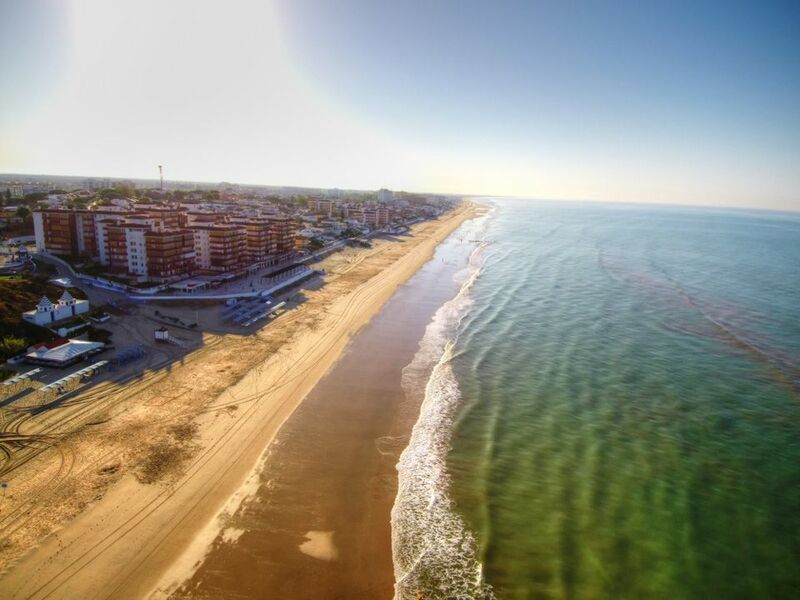 You will also get a to taste the best-fried fish on all of Spain but keep in the mind that since this beach is further away from Seville than Playa Matalascañas, you may want to spend the night.